Perfect Money - Are Cryptocurrencies the Money of the Future? It is already a long time ago that Austrian economists have started to research the characteristics of good money. They came up with three key characteristics: Limited supply, durability, and divisibility. In this essay, I will try to expand on this theory and present my own thoughts on what constitutes good money. This will include a discussion of safety (fixed supply, recognizable, restorable, encrypted, hideable, fungible, and accessible) and usability (divisible, portable, transferable, and showable). The first section of this essay will give a brief history of how the concept of money came into being. It will also present a definition of money and its key properties. From this knowledge, the second and third sections will then expand on the characteristics of good money. The fourth section will compare gold, government currencies, and cryptocurrencies according to the characteristics of good money. I will not use one specific cryptocurrency for this comparison, but rather I will compare gold and government currencies to what I believe should theoretically be possible to implement in a cryptocurrency. The fifth section will conclude the essay. The conclusion is that cryptocurrencies will likely in some form, at some time replace government currencies and become the money of the future. Imagine a relatively isolated primitive society, as in the stone ages. The people of this society have some division of labor, and they produce many different goods. There are fishermen, lumberjacks, bakers and so on. Since the society is relatively isolated, they mostly trade their goods amongst each other. If for example the fisher wants some wood, he has to trade fish for wood. But what if the lumberjack currently doesn’t want any fish. Instead, he wants bread. So the fisher would have to go to the baker, trade fish for bread and then go back to the lumberjack and trade the bread for wood. But what if the baker doesn’t want any fish either? And how many fish is a pile of wood worth anyways? How can he estimate if the lumberjack is giving him a fair deal? These are both problems that could regularly beset the fisher. Let us assume, for the sake of argument, that many people in this society like to smoke tobacco in their leisure time. So more people desire tobacco than fish for example. Sooner or later the fisher may start to notice this. Perhaps he will even start to keep some tobacco, not because he wants to smoke it himself, but because he knows that many people are willing to trade for it. As he does this, he too is now willing to trade his goods for tobacco. With each person that follows his example, the number of people who are willing to trade their goods for tobacco increases. And as their number increases, even more people will start to notice that tobacco is high in demand. This is a self-reinforcing mechanism, which tends towards a locally stable equilibrium, in which everyone is willing to trade their goods for tobacco. Tobacco has essentially become the money of that society. Of course, it does not have to be tobacco that ends up being the money of a society. It could be any good, and a different one in every separate economy. However, it is highly likely that at least one good will emerge as money, because the emergence of money is a self-reinforcing process, meaning it will occur of its own accord, without requiring any conscious effort. The introduction of money solves the problem of matching needs, which was in our example that the fisher wants wood, but the lumberjack does not want fish. The fisher can now just find anyone who wants fish and trade his fish for tobacco. With this tobacco, he can then “buy” wood from the lumberjack. The lumberjack will likely agree to this trade, because he knows that he will be able to “buy” bread from the baker with the tobacco that he just got. And the Baker will likely agree to this trade as well, because he can later use the tobacco to buy whatever he wants… Tobacco thus facilitates trade by acting as a medium of exchange. The introduction of money also solves the problem of price formation and thus answers the question how many fish a pile of wood is worth. Suppose there are five fishermen in this village. Since they all want to sell their fish for tobacco, it is really easy for everybody else to judge which of them makes the best offer in terms of fish per tobacco. The five fishermen basically form a small fish market, and in the market the price emerges as a consequence of supply and demand. The same happens of course also for wood and for every other good. And as the price for fish and wood are now known, the question of how many fish a pile of wood costs is answered. Besides facilitating trade (medium of exchange) and acting as an objective measure of value (price formation), money also serves as a store of value. The fisher can put aside some tobacco for when he gets sick, or for when his wife expects a baby, or for any time he might have to consume more than he can immediately produce. He can also save up money for a bigger investment, like a new fisher boat, a house, or a cow. The first flaw of tobacco that comes to mind is that it can decay in all kinds of ways. If the fisher puts aside some tobacco and it rots away, that is a major problem. If he gets sick and his saved up tobacco is gone, he might die. If he was saving for a house and his tobacco gets destroyed, he would have lost all the labor he saved up so far. To avoid this problem, good money must be durable. The second big problem with tobacco is that its supply is not limited. Anyone can grow as much tobacco as they want. If people produce more and more tobacco, they inflate the money supply, meaning that it will cost more and more tobacco to buy a certain good. This can quickly escalate to the point where it takes a wheel barrel full of tobacco to buy a bread, which would render tobacco very impractical as money. As we know from various examples of hyperinflation all around the world, this can not only happen with tobacco, but also with government issued currencies. In hyperinflation, everybody who worked hard for their whole life to save up some money loses all of their savings in an instant. This often is a life shattering tragedy. Therefore, good money absolutely has to have a limited supply. In the stone ages, some tribes used cattle as money. This seems like an obvious choice, if they are all herdsmen, but cattle is not very well suited as money. Imagine ten loafs of bread cost one cow, but Bob only wants to buy two loafs. He can’t give his trade partner 0.2 cows… To avoid this problem, good money has to be divisible. Austrian economists have already identified these three characteristics of good money a long time ago. Because gold and silver satisfy these criteria very well, people used them as money for a very long time. They are both limited in supply, divisible, and durable. But precious metals are not perfect as money. In the next section, I will present my own thoughts on the characteristics of good money. What I ideally would want is that my money is under my perfect volitional control; that I could telepathically beam it to whomever I want, whenever I want, and that it could not leave my possession without my free and voluntary conscious consent. This means it can’t be lost, stolen, robed, or extorted. Further, I want that no one can lie to me about how much money they own, give me fake money, or devalue my money in any way. All of these wishes come down to two categories: safety and usability. Good money has to be safe, such that there exists no danger that I might lose the labor I invested into getting it. Good money also has to be usable, such that my everyday use of it is as simple and as easy as possible. With this ideal state in mind, let us come back to the present and try to break safety and usability down into their component characteristics. What characteristics must a good that we can produce today have, in order to come as close as possible to the previously described ideal state? There are many ways in which a person could lose the labor they invested into getting their money. Good money should protect its owner against all of them. If you put aside money for the future, it should of course not be devalued or destroyed in any way. Good money should be fixed in supply, meaning it can neither be created nor destroyed. This protects against devaluation through inflation (creation) or loss of ones money through destruction. Good money should also be recognizable, such that it can't be faked. If you trade your goods for faked money and you later discover this fact, you would have traded them for something worthless and thus you would have been cheated out of your money. Precious metals and cash can be lost through accidents or carelessness. Good money should be restorable, such that if you lose the device you use to handle it, for example your credit card, you can go through a reliable process to restore it. That way you did not lose your money, but only a plastic card. Gold or cash can be stolen. Anyone who finds them can just take them and spend them. It would be great if a person’s money were protected by a password that only they themselves knew. Then it could not be stolen or seized by government. Good money should be encrypted. Money can also be robbed or extorted. You can hide gold and cash at home, or put them in a safe. But if you want to take them somewhere, a criminal can always stop you in the street and rob you. If a person is known to be rich, a criminal could blackmail or threaten them to get their money. To be protected against robbery and extortion, no one should have any way of finding out how much money a person owns. Good money should be hideable. Good money should also be fungible, meaning it should behave like a physical good. Two units of money should be indistinguishable from one another. Because if they aren’t, then the danger exists that the money you own could be singled out and rejected. This again would mean that you lost the labor you invested into getting it. If a person can be blocked from using their money, that has the same effect as them not having it at all. If for example your bank account or credit card gets frozen, you have a huge problem. Therefore, good money should always be accessible. For maximal usability, one should be able to always and effortlessly have ones money at ones disposal. If one wishes to have only a fraction of ones money at ones disposal for a certain time, that should of course be possible too. As previously discussed, good money should also be divisible. Good money has to be portable. Ideally, it would have zero weight and zero volume, such that you can carry as much money as you want with you wherever you go. Precious metals and cash have to be physically passed from person to person. It would be far more practical if a person could just beam their money instantly to anyone, anywhere in the world, with zero cost. Good money should be easily transferable. Ideally, no one should be able to lie to another about how much money they own. Good money should be showable, meaning that you can – if you want to – prove to another person that you own at least X amount of money. Now that we have a more detailed understanding of the characteristics of good money, we will compare some currencies to find out which one of them comes closest to the ideal. Table 1 compares gold, government currencies, and cryptocurrencies according to the criteria of good money. The cryptocurrency column is an estimation of what I – according to my research – believe to be possible. I do not know of any cryptocurrency that satisfies all the characteristics of good money to the extent described in Table 1, although for each characteristic itself (except maybe showability) there are cryptocurrencies that do. Table 1: Comparison of gold, government currencies, and cryptocurrencies. 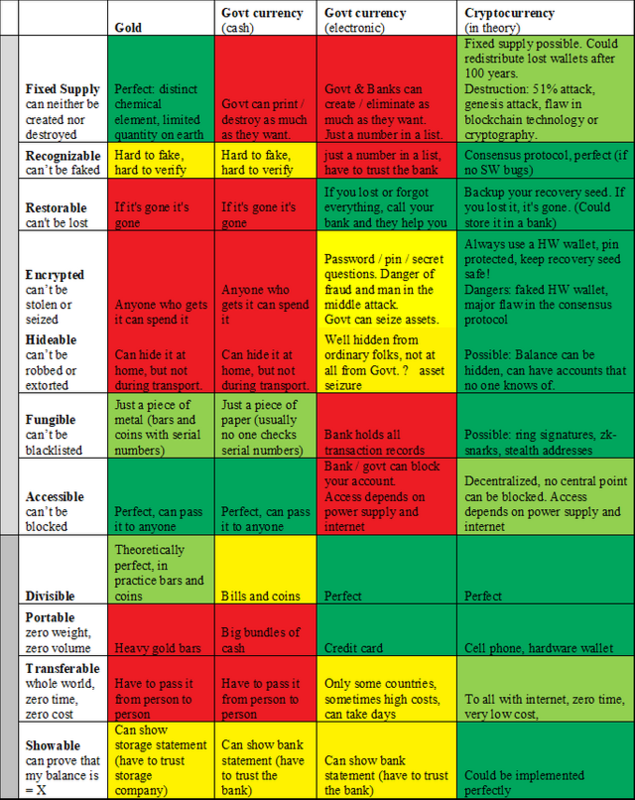 The first section compares safety, the second one usability. As you can clearly see in Table 1, cryptocurrencies have the potential to become our future money. They can do better (and often much better) than government currencies in almost every point. Their only real limitation is that they depend on a large and complex ecosystem of technology that has to be working in the background. If any critical part of this technical infrastructure gives way, cryptocurrencies might be temporarily blocked or completely destroyed. Gold and Cash do not have this risk. The electronic money we mostly use today however has the same weakness, and as we have seen, cryptocurrencies have many advantages over it. So while this fact should be kept in mind, I don’t think it will hinder the adoption of cryptocurrencies. Currently cryptocurrencies are still in a very early stage of development, their use is still annoying and impractical, and no cryptocurrency yet satisfies all the characteristics of good money to the extent described in Table 1. But once one or more fully functional cryptocurrencies exists, I believe their use will spread rapidly, because they will just be better money than anything that exists today. Congratulations @amoszweig! You received a personal award! Hello @amoszweig! This is a friendly reminder that you have 3000 Partiko Points unclaimed in your Partiko account!